It is no secret that we experienced rampant water restrictions and many smoky days this summer. Scientific predictions point towards more dry summers meaning now more than ever we have to be water responsible. Join one of Canada’s top permaculture educators, Rob Avis, for this workshop and explore capturing rainwater and other water harvesting strategies. This 3 hr workshop will pack in many of the key components of water harvesting. You will discover how to ‘plant the water’ and we will explore how to capture rainwater from roofs and other surfaces. In-ground water harvesting strategies, passive water storage and active storage will be discussed. 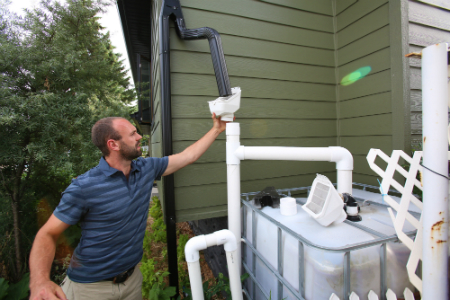 You’ll also get a hands-on demo in building a water-harvesting system with simple tools that you can create for a few dollars with materials from your local hardware store. Commit to reducing your water consumption and shrinking your environmental footprint, Register today! To find out more information about the workshops or to ask about volunteer bursaries contact Sophie cranbrookfood@gmail.com; 250-520-0409 or Dirk dirk@wildsight.ca; 250-422-3579. To connect with the Cranbrook Public Produce Garden visit Cranbrook Food Action Committee on Facebook or email cranbrookfood@gmail.com. To find out more about the Kimberley Open Gate Garden, email dirk@wildsight.ca.